The 2018/2019 Scott Celeste III was tested in the women's Backcountry category at Silver Mountain Resort by the experts at America's Best Bootfitters, powered by Masterfit. 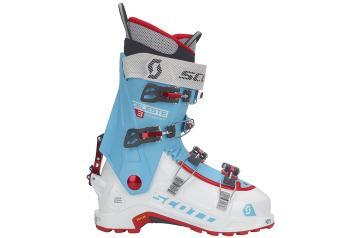 Comfort, performance, uphill functionality and good looks put the 2019 Scott Celeste III on top of the group of Backcountry category boots for our women's test team. This year's version comes with last year's re-designed cuff release and lock mechanism that provides a more solid connection between lower shell and cuff but also reduces friction fore and aft while in hike mode. Testers appreciated its straightforward entry, closure and evenly medium fit on the foot. While Scott calls it a 103.5 mm last, they measure the 27 here, rather than the standard reference size 26, so bear in mind this is a medium, not a wide, and testers confirmed that. They liked the comfy, neutral grip it put on their feet—no weird edges or pressure points so common in BC boots—and they also liked the flex feel. A couple testers mentioned a bit of an abrupt spot on the lower shin, but found that remedied after full-thermo liner molding. Hard chargers will not be disappointed with how this full-Grilamid tourer skis, testers relayed, citing an easy roll side to side for predictable edging on both fat and skinny skis. Word was that the flex feel was a little shy of the 110 billing, but far from collapsing. The padded cushioning of the PWR Lite Ultralon foam liner (while nice on the foot and leg) robbed a little bit of agility and snap in transitions, testers said. Testers found the Dynafit-certified tech fittings easy to click in and out of bindings and lauded the simplicity of the new Rear Hook walk system cuff release. Four buckles and a Velcro powerstrap are a nice feature—simple—and the top two buckles have catch keepers for hassle-free touring then locking down.